I'm going from Stage1->Stage2 right now. I'm pretty slow since / is networked, but it seems to be working. Using the standard ppc build. I'll let you when the complete system is up. any chance of posting a quick howto? Actually I put the work on hold when moving from Stage2->Stage3. The problem is I've been running out of memory. The cube has 24 megs of RAM and after the kernel is loaded only about 21 is usable. You have 16 megs of ARAM of which 2 is used for the sound driver and the other 14 is used for swap. To compile C++ apps you need some major memory. So I setup an NBD and used that for some additional swap. The problem right now is that the network card only runs at 10 Mbps which is causing some major lag. All the files are on the network AND your swap is on the network. So the system is constantly firing packets back and forth at a very slow rate. I am doing some kernel work and when I get the interface up and running at 100 Mbps I will continue the installation! how did you do this did you do it using psoload or what ? OK I installed it successfully now. I used a Stage3 installation this time instead of going from 1->3. I emerging everything and I'm up to date. GCC failed so I'm still stuck at 3.2.3 instead of 3.3.3 but I think I might try another version to see if it works. And yes I used psoload to get it to work. I used the debian base image as my default, and then installed gentoo in the /mnt directory that I chroot'd to. I extracted the stage3 PPC installation there. 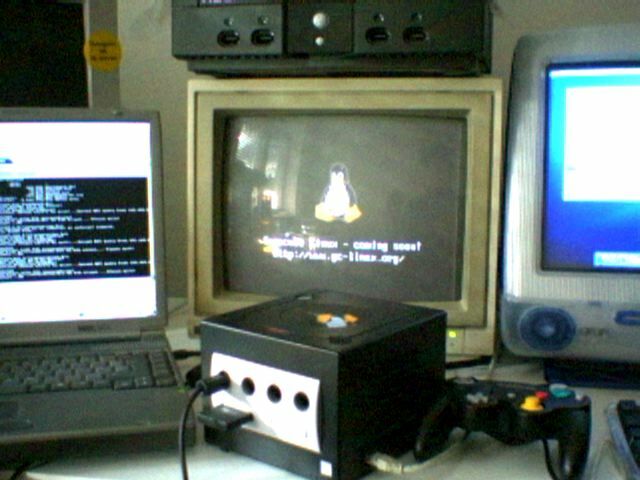 can i ask why you installed gentoo on the gamecube, keep in mind i am new at this so go easy on me for asking a stupid question. A perfectly acceptable answer would be: "Because I could"
I've done that kind of installs like a million times, everything from old sparcs to old powermacs. It's not really useful or everything but it's possible. Therefor it had to be done. It's kinda neat to be the only person in the world to have it up and running? The only logical next step is to have a NES emulator running on it.. This weekend I will get a custom SDL and Snes9X that works well with the Cube. I need to find an NES emulator that works with the framebuffer though. OK I managed to get gcc-3.3.4 installed after I updated binutils and gcc-config. Now I'm building an updated glibc. Then I'll have a up to date system! Perhaps you could do a website about your project with some photos and guidelines for others to achieve the same as you? Too bad I don't own a GC, I'd install Gentoo on it too to run Nintendo emulators.. Doesn't the cube run on a version of ATI's radeon chipset? In other words, you should be able to hack a radeon driver into it, and use OpenGL instead of framebuffer. Lots of emulators support OpenGL instead of others, including Snes9X. The cube DOES NOT have a Radeon compatible video card. The chip is custom by ArtX (which got bought out by ATi AFTER the chip was finalized). I have the documentation and I am thinking about writing an OpenGL implementation for it. I am working on hacking fceultra to work with the 3D instead of the 2D framebuffer. Once the 3D stuff is working I am going to get Snes9X running on it using the 3D hardware. I would also like a brief description on how you got it working. I'm using the kernel att www.gc-linux.org and I got their Debian NFS-root working. But I'm totally unfamilliar with debian so I would like to use gentoo instead. It seems that some tweaking is necessary to get the init-scripts running. Ah, hehe. I had a feeling that it could be you, but then again, you never know. Thanks for the help! It's nice to be able to play videos on the TV now, unfortunately NFS is a little slow over a wireless lan so they're a bit choppy. But it works! Also, I learned a great deal during the process. Posted: Thu Jan 13, 2005 6:53 am Post subject: . Congrats to all who could do it. The CPU info was changed so that it would conform to some network-computation effort. It really isn't a 745/755, but a modified 750CXe. Apparently the program needed a valid value before it would run.